A 60 minute monochrome film directed, produced and written by Christopher Munch, who was also the cinematographer. 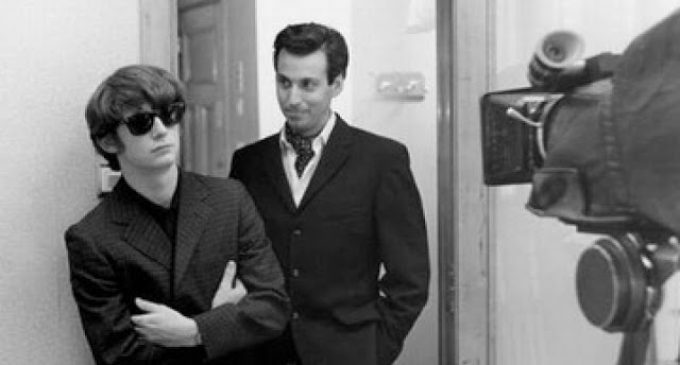 The movie was released in 1991 and concerned the brief holiday John Lennon and Brian Epstein took in Spain in 1963. Filmed at the Avenida Palace Hotel in Barcelona, ‘The Hours And Times’ featured actor Ian Hart as John and David Angus as Brian. The synopsis for the Antarctic Pictures production read: “The friendship of Brian Epstein and John Lennon has been the subject of speculation and myth. To portray a sense of that generous, intense and ambiguous friendship is the intent of the film, a work of fiction taking place over just four days. “The story is set in a city of mythic beauty, Barcelona, where in the spring of 1963, following a gruelling winter of touring, Epstein and Lennon spent a memorable holiday. More than a holiday, it marked a crucial juncture in both men’s lives: while six months had yet to elapse before Beatlemania would fully engulf Britain (nine months before America), Lennon’s first child had just been born, and his marriage was beginning to stand the test of burgeoning stardom. At the time, Epstein, whose affection for Spain was to last up until his premature death in 1967, was poised before the immense dizzying potential that lay just ahead, his personal life an adventuresome whirlwind of exultation and despondency. Within this tense historical context the story unfolds. “The film was shot entirely on location in Barcelona amidst landmarks of the great Catalan architect, Antoni Gaudi. Much of the action occurs in the Hotel Avenida Palace, one of Europe’s most majestic. Additional photography took place in Liverpool, once the most important port city of northern England, and birthplace of the Beatles. 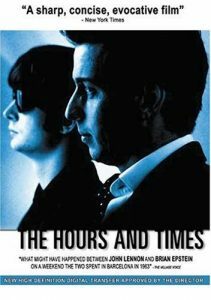 ‘The Hours And Times’ was premiered in Britain on Saturday, 13 June, 1992 at the Southampton University during the Southampton Film Festival as a special John Lennon Evening, which also featured a series of Yoko Ono films: ‘Number Four’, ‘Love, Love Love’ and ‘Ai Love’, which was followed by a live debate about the film with David Angus, Ian Hart and Bill Harry on the panel. “I was on holiday with Brian Epstein in Spain, where the rumours went around that he and I were having a love affair. Well, it was almost a love affair, but not quite. It was never consummated. But it was a pretty intense relationship. Written by: Bill Harry ©2017. All rights reserved. No unauthorised copying or re-publishing of this material is allowed by law. Please contact the writer for re-print permission.